Do you like clocks, tools, wood, and building things with your hands (not necessarily in that order)? You should check out the clock designs from Clayton Boyer. 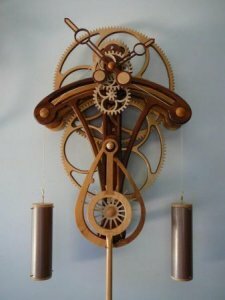 Not only does he design and build amazing wooden gear clocks, but he also sells the plans so that the rest of us can have these pieces of art in our houses. If you have the tools, the time and the patients, you would probably have a blast building one of his beauties that you can then past down to your children.